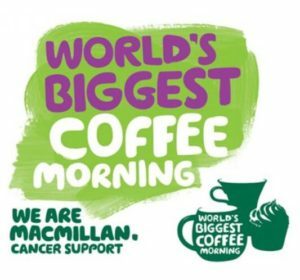 The PTA are hosting a Macmillan Coffee Morning on Friday 28th September 9-9:45 in the school hall. We need donations of nut-free cakes to be brought into the school on the morning, these can be baked or bought we’re really not fussy. We also need volunteers to help serve drinks and cake on the morning. If you’re able to help please can you contact the PTA otherwise we’d love to see as many people in the morning pop along, bring a friend or family member have a slice of cake or two with a nice cuppa and raise money for Macmillan.